This year I am riding for ….. This time I wanted to ride for a UK charity and not one of the more well known ones. So I have picked an organisation that does some fantastic practical work to help disadvantaged people and their carers who are often the forgotten heroes. Please check out my sponsorship page here…. I intend to auction of some fantastic cycling related prizes, subscribe to this blog to keep updated. Revitalise is a national charity providing respite care in a holiday setting for disabled people and carers for over 50 years. Revitalise also offers inspirational opportunities for volunteers through one of the largest and most diverse volunteering programmes of any UK charity. Hello Webosphere, “The man on a bike” is back for more cycling adventures in preparation for RIDELONDON 2016. 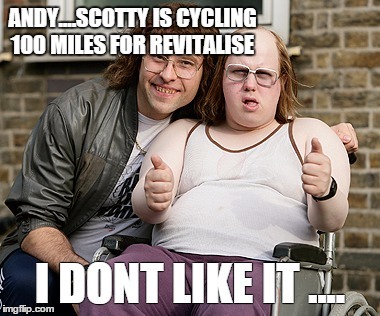 This year I am riding for the charity Revitalise (More about that in a later post). Having not been on the bike much over the winter, I am feeling rather fat, old and unfit. I am guessing all that is going to have to change again. Getting ready for Ridelondon never seems to get any easier so this year is going to be a challenge. So far the cycling activities this year have included. 1: Giving the bike a clean / service / oil and general overall. 2: A couple of commutes to work – just to check the bike is all good and everything is working. 3: A few hours on the turbo, just to see if the legs still work. 1: The bike is very clean. 2: The distance to work seems to be 3x what I remember. 3: My Legs seem to have forgotten everything about cycling.